Campioni del Mondo! 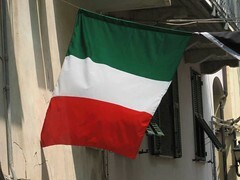 Weeks after the world cup victory, the tricolore is still waving proudly in unexpected places! Taken in Corniglia, possibly the cutest of the five villages of the cinque terre. Posted on 10:58, 05 august 2006.